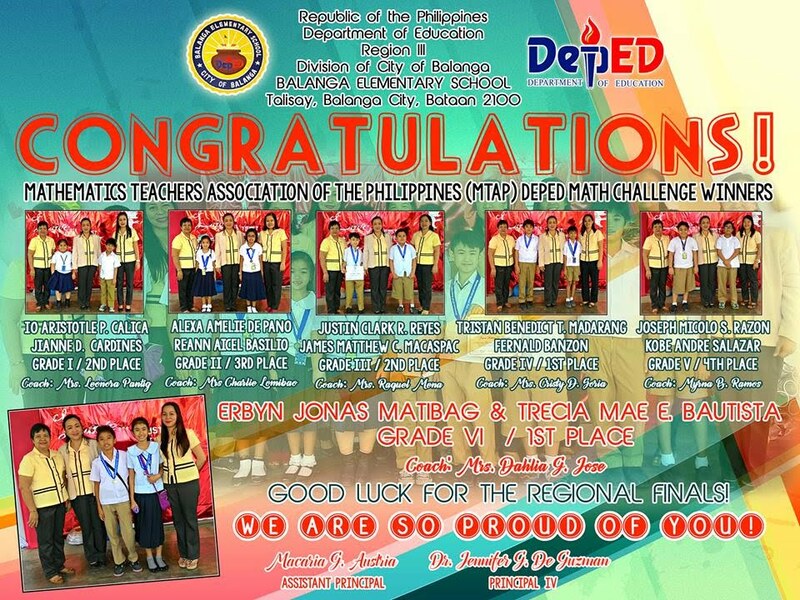 Balanga Elementary School (BES) emerged as champion in the recently concluded Division MTAP Math Challenge Finals on February 4, 2016 at Tenejero Elementary School. Grades 1 to Grades 6 garnered awards in the team challenge. The following winners are: Grade 1- Io Nikolai Aristotle Calica & Jianne Cardines, 2nd place (Coach: Mrs. Leonora Pantig); Grade 2- Alexa De Pano & Reann Axel Basilio, 3rd place (Coach: Mrs. Charlie Lomibao); Grade3- James Matthew Macaspac & Justin Clark Reyes, 2nd place (Mrs. Raquel Mena); Grade 4- Tristan Benedict Madarang & Fernald Banzon, 1st place (Coach: Mrs. Cristy Soria); Grade 5- Kobe Andre Salazar & Joseph Micolo Razon, 4th place (Coach: Mrs. Myrna Ramos); and Grade 6- Erbyn Jonas Matibag & Trecia Mae Bautista, 1st place (Coach: Mrs. Dahlia Jose). Both Matibag and Bautista will represent the City Division of Balanga in the upcoming Regional MTAP Math Challenge on Feb. 19, 2016.